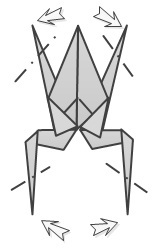 This frog is one of the best known traditional origami models, and one of my personal favourites. 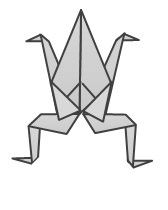 The traditional origami frog has that slightly angular feel to it that is typical of a lot of traditional origami models, but it has a striking appearance with strong clean lines and represents the shape of the animal very well. Not surprisingly, you use the frog base as the starting point for this model. 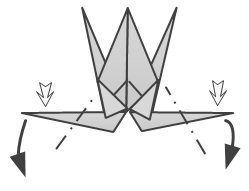 The last step of the instructions calls for the simple origami frog model to be inflated by blowing into the base of it. 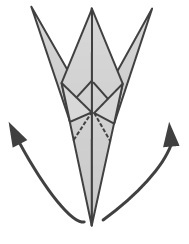 Once inflated it is possible to make the frog jump lightly by pressing at the bottom of the model. While this is quite fun, I prefer not to do this as it spoils the clean shape of the model, and can make the legs splay out oddly if the frog is over-inflated. 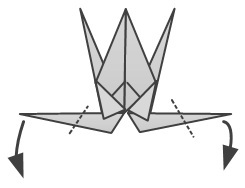 This simple origami frog model is quite forgiving about what paper to use. Traditional origami paper is fine, although if you do want to inflate the frog and make it jump, something slightly stiffer might work better. 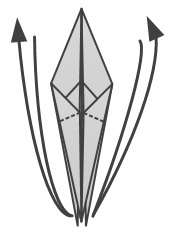 There’s not really a lot you can do to shape this model, other than to inflate it. Once inflated, you can make the frog jump slightly by pressing between the two rear legs and letting go. 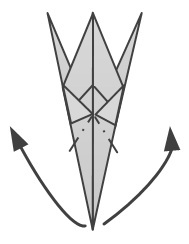 I’d love to hear your views on this easy origami frog for beginners. Feel free to let me know what you think in the comments below, or you find can me on Instagram or Twitter. Check out my Pinterest boards too! Glad you liked it! Sorry I didn’t reply sooner, my spam filter has been blocking a lot of posts. Anyway, I’m glad you found it and I hope you like some of the other articles on the site in the future.